Peter Sciarra is the ICS Head Instructor. He holds a level 11 Black Belt and is currently Australia’s highest ranked Close Quarter Combat instructor. He regularly teaches in 15 countries around the world and is one of Australia’s leading combat instructors. Hock Hochhiem, Peter’s main mentor in the U.S considers him one of his best and most skilled instructors and is part of Hock’s elite Black Belt instructors. He has made multiple trips to the U.S.A to train with some of the best Close Quarter Combat instructors in the world. Peter has also had over 20 years of martial arts experience, holds Black Belts in other systems and was the first Australian ever to be invited to teach combat at the UFC gym in California. Peter began his training at the age of thirteen in the arts of Wing Chun, jujustu and kickboxing and received his first Black belt at 16 years old. At the age of 19 Peter began work in the security industry as a nightclub bouncer in Melbourne. It was during this period that Peter discovered what worked and what didn’t in the real world. Peter also trains members of the Victoria Police, Australian military ,security personnel and civilians. Peter’s home training facilities are located in Melbourne Australia. 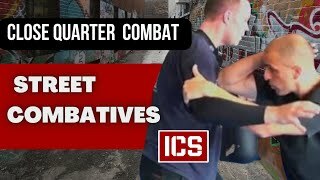 See more videos below of Peter in action training people on how to defend themselves using CQC.